There was a very enlightening editorial in the Tribune this morning, but judging by the number of comments it has received online I suspect that not many people read it. That’s probably the very definition of irony as the editorial speaks of how few people voted for Warren’s elected city officials. You can see the numbers in the chart to the right. While I remain optimistic about the future of Warren most days, progress will be too slow and too incremental unless a greater number of people living in the city take an active role in creating the future they want. And it isn’t just about voting. Election participation is just an expression of the scope of the problem. Attend any meeting of City Council or one of its committee meetings and you see the same 20 or so faces. Attend any neighborhood association meeting and you’ll see the same 10 people. Attend any event associated with the betterment of the city and it is the same 50 faces. I estimate that there are no more than 250 people actively engaged in community improvement in the city of Warren. That is less than 1/2 of 1% of the population. There are certainly a greater number of people filled with strongly held opinions about the nature and cause of the city’s problems — and they are generally based on wildly inaccurate information about the problems and what’s being done about it. Those people don’t just do nothing, they make matters worth by spreading misinformation and bile to the rest of us. I’ve spent enough time in the media business to know there is very little to be gained by hectoring one’s audience. I’ve had this data for more than six months but resisted publishing it because I felt there was little to be gained. But the cat is out of the bag now so you might as well know the depth of the problem. Please don’t comment saying it’s all the fault of this party or that, this person or another. The fault dear reader, is ours. Posted Wednesday, April 3rd, 2013 under Life in Warren, Recommended reading, Vision. Bravo! One of single best local article yet as to why government doesn’t serve us well and the very simple (numbingly simple) solution to have it do so. That…and backing off all the trolls away from their keyboards. Thanks Jim. It can be disheartening but all it takes is a simple shift in momentum. Once that happens all things are possible. 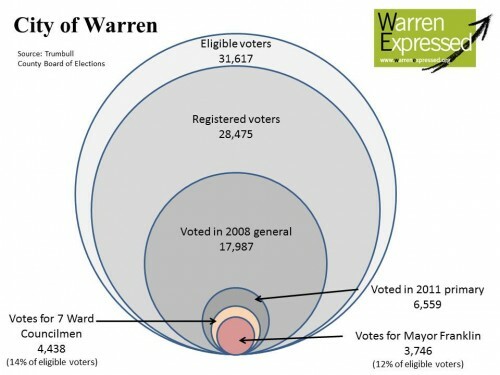 If I still lived in Warren, I’d want to help. My mom lives two doors away from that after-the-party-stabbing on Grant Street, and my sister lives at the other end of Grant, so even though I live in Columbus I know how bad it can be in Warren. I guess everyone thinks someone else will do the work, so no one ends up doing anything. But doesn’t Warren have pretty good help for Make A Difference Day? Seems like I remember some Warren group getting one of the awards for that a few years back. Maybe the groups that participate in that could get together and do something bigger. I lived in a small city in SW Ohio – about 10,000 people – and the school system there sponsored a Make A Difference Day program that took off like crazy. Do the Warren schools have a community service program? Maybe someone could approach them with ideas. My daughter goes to Dublin, OH, schools and every student is supposed to complete a certain number of community service hours before they graduate, which makes for a pretty large pool of volunteers. I agree about the “shift in momentum” statement, and I’ve seen some good things happen in the city, so I hope it will reach that tipping point one of these days soon. Most of these things do exist and some, like Make-a-difference day are successful. However, the challenges are huge and these efforts simply aren’t enough. It’s great that people come out for a day and do something but sustained effort by more people is required if Warren is to revive — maybe even to survive. Maybe the high school can stress the importance of voting and community involvement, especially in seniors, some who are or will be of voting age. How old are the community leaders? Seems to be we baby boomers are phasing out, so the next generation needs to become involved!